This nightmare before Christmas was found in our photo collection. The Santa mask is unsettling. But the wearer is doing their best to spread some holiday cheer, with a bell in one hand and a doll, toy horse, and drum at the ready. 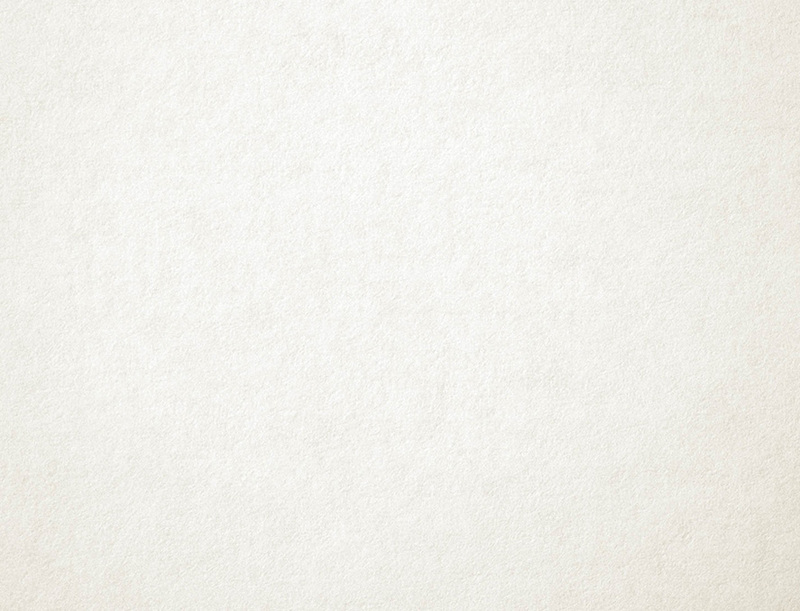 This digital recreation shows what the printed image would look like. The verse in the lower-right is an excerpt from Henry Wadsworth Longfellow’s Building of the Ship (1849). The artwork is by Roger Deering (1904-1980). Fireproof “Christmas decoration”, aka. tinsel. 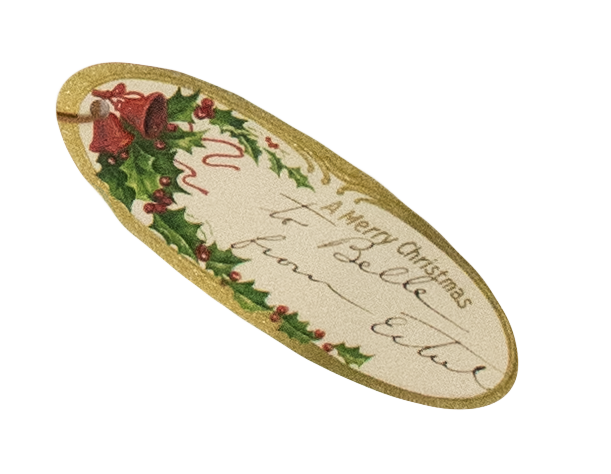 This was manufactured by B. Wilmsen Company in Philadelphia, one of the Christmas decoration heavyweights from the 1880s to 1960s. 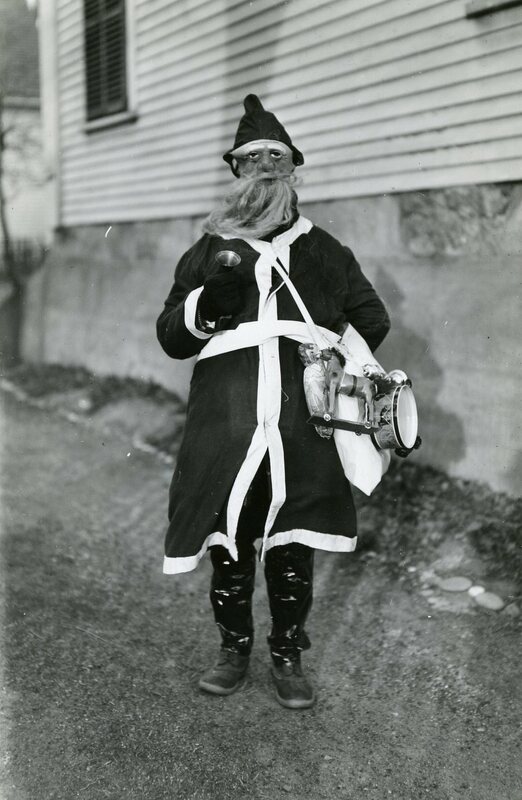 In 1922 Mr. Wilmsen testified before the Senate Committee on Finance to warn that proposed tinsel tarrifs would jeopardize his import of quality product from Rotterdam (American-made tinsel, he reported, blackened too quickly). 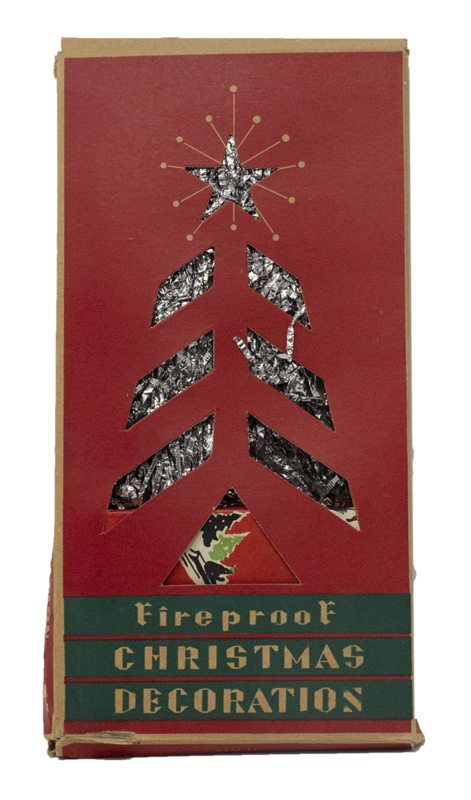 The “fireproof” designation is meant to reassure shoppers that this tinsel is completely safe. At the time, it meant that the tinsel was made not from aluminum, but rather lead. Lead tinsel was later banned in 1972. Shop for Christmas ornaments these days and you’ll see that they target a millennial sense of humor and love of the absurd. Santas riding flamingos. Frogs dressed in Victorian suits. Zombie gingerbread men. It’s not a new phenomenon, though, as shown by this ornament of a stork dressed in a top hat and carrying an umbrella. Was it meant to commemorate “Baby’s First Christmas”? Or just a Noël non-sequitir? 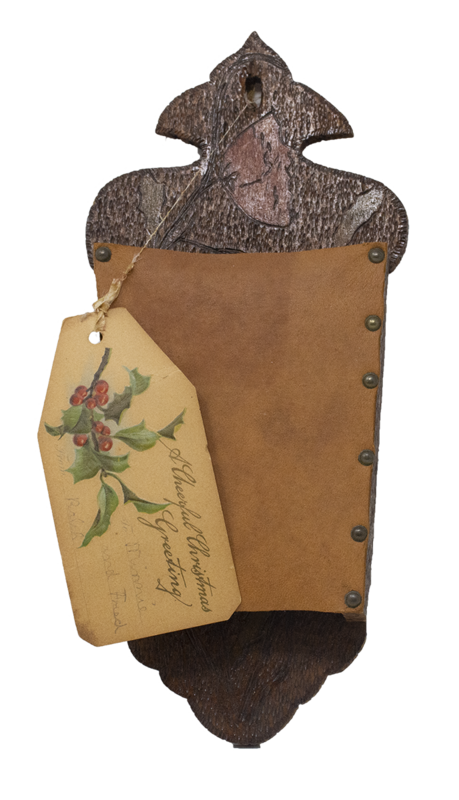 This is a wood and leather broom holder with pyrographed (burnt wood) decoration. The broom is gone, but it would have been just the sort of tool to sweep up an undigested bit of beef, a blot of mustard, a crumb of cheese, or a fragment of an underdone potato. What did Minnie and Fred think of their Christmas present? It’s hard to say, but the fact that the tag was left on isn’t a good sign. Christmas cards are a time-honored venue to brag about your children’s accomplishments. Henry F. Merrill’s had much to brag about—his daughter, Ruth, had a ship named after her (“does yours?”). 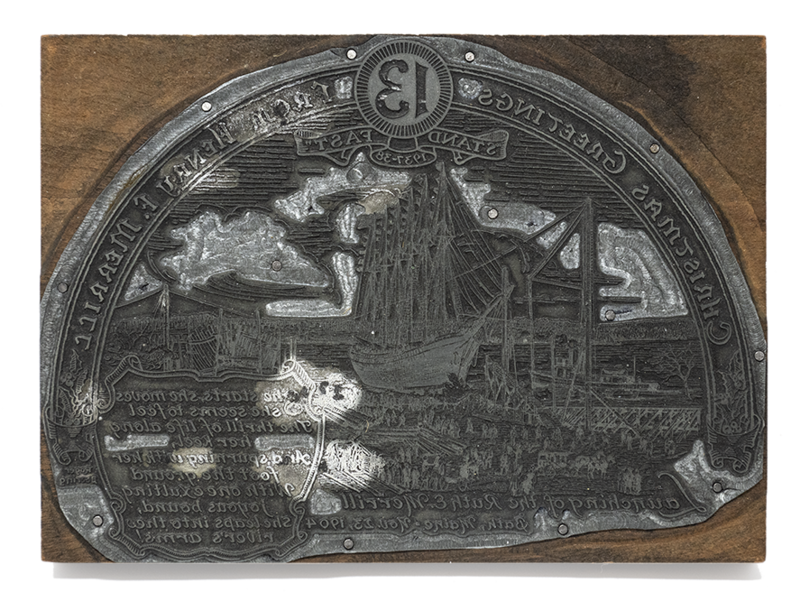 This printing plate for Henry’s 1937 Christmas card shows the Ruth E. Merrill launched at the Percy & Small shipyard in 1904. 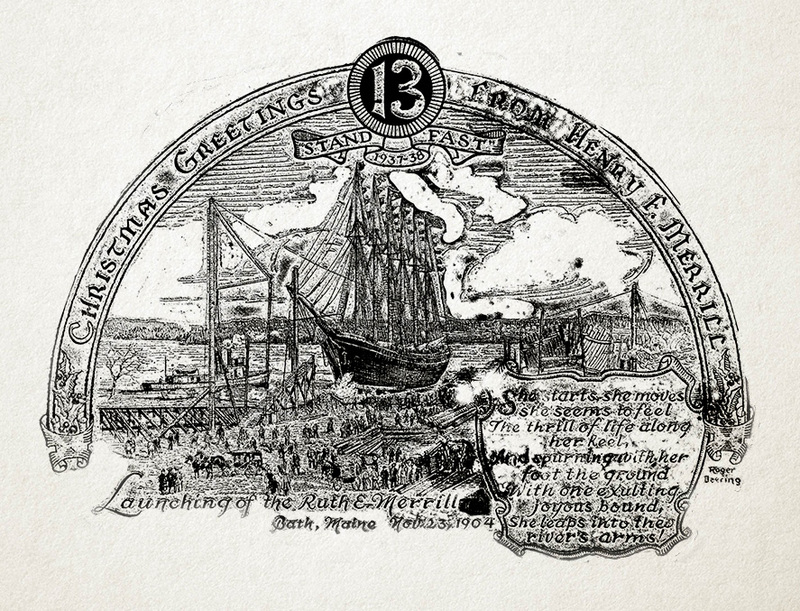 By the time this card was printed it had been thirteen years since the vessel was lost in a gale off Woods Hole (possibly what the 13 at the top of the card refers to). The fact that the Ruth E. Merrill was a large coal schooner no doubt made Henry, principal of the Randall & McAllister Coal Company in Portland, even prouder. Some are taught that every time a bell rings an angel gets its wings. To an engineer aboard a steam-powered vessel, it was far more complicated. Because there was no direct control of the engine from the helm, a system of wire-activated bells relayed helm commands to the engine room. 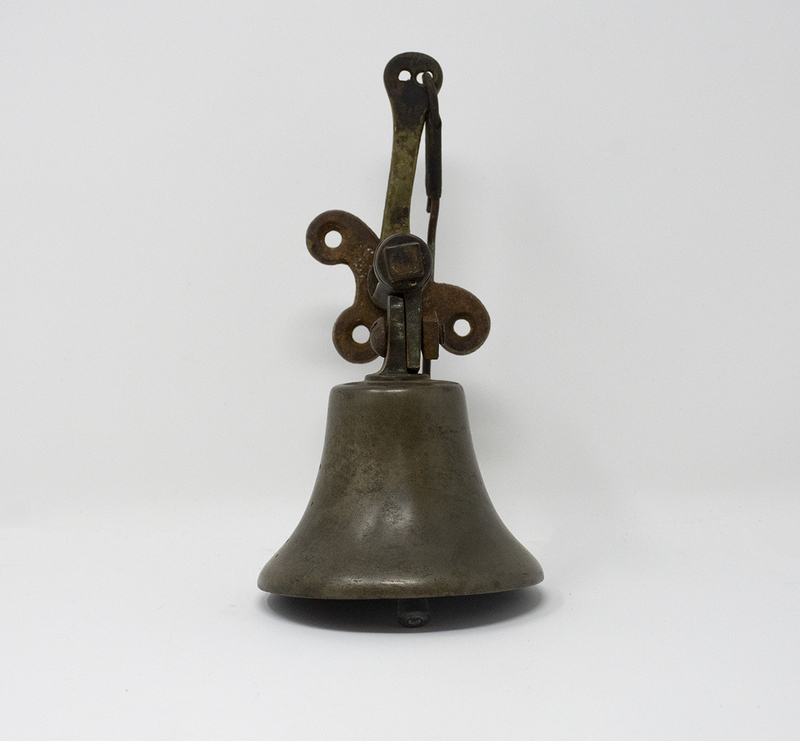 Two bells—a large bell and a smaller “jingle bell”—were used and had different meanings. A large bell while at stop? Slow ahead. Then the jingle bell? Full ahead. This particular jingle bell is from the tugboat Seguin. It must have been given a workout on a cold December 15, 1909, when Seguin helped maneuver the six-masted Wyoming, the largest wooden schooner ever built, after her launch. 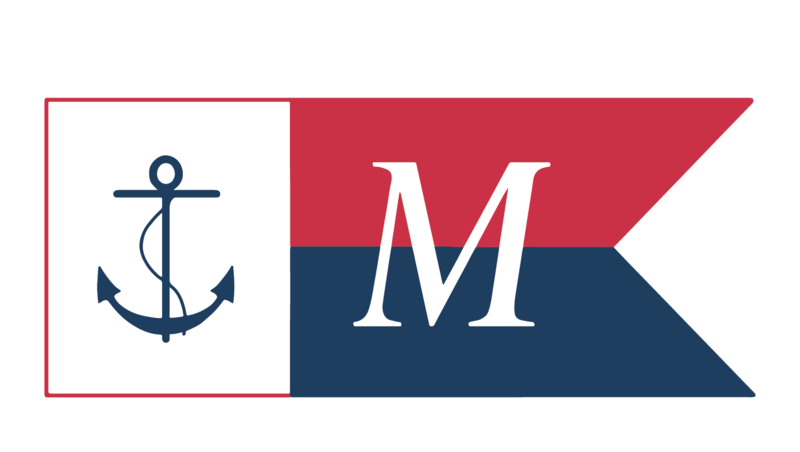 New England Shipbuilding Corporation is proudly launching Ocean and Liberty class ships “Down the Ways in Fewer Days.” By war’s end 266 ships were launched. 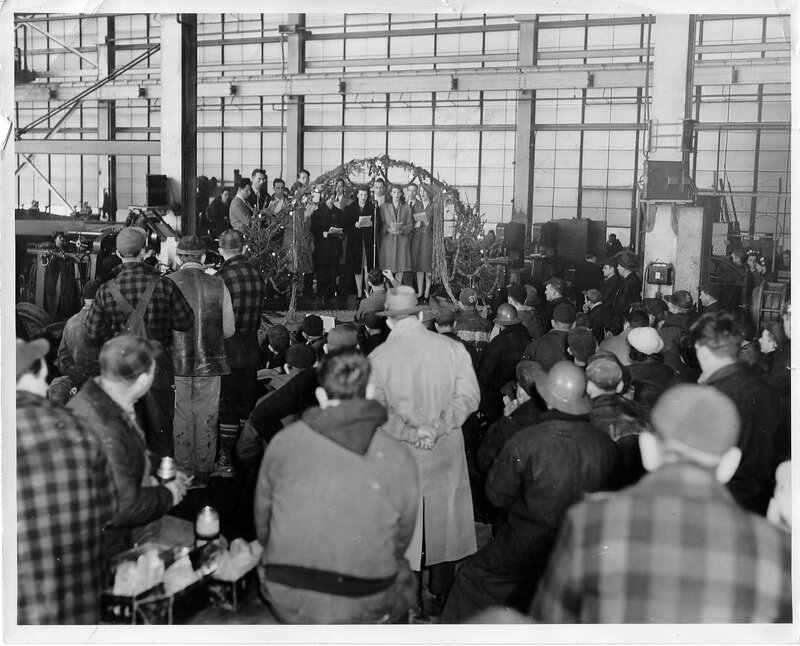 Here the Employees Choral Group entertains workers from a decorated bandstand. It appears to be indoors, although the workers and performers still have their coats on. It was a nice break for some holiday cheer and a meal; lunchboxes and thermoses are open near the foreground. Family photos are a must around the holidays. 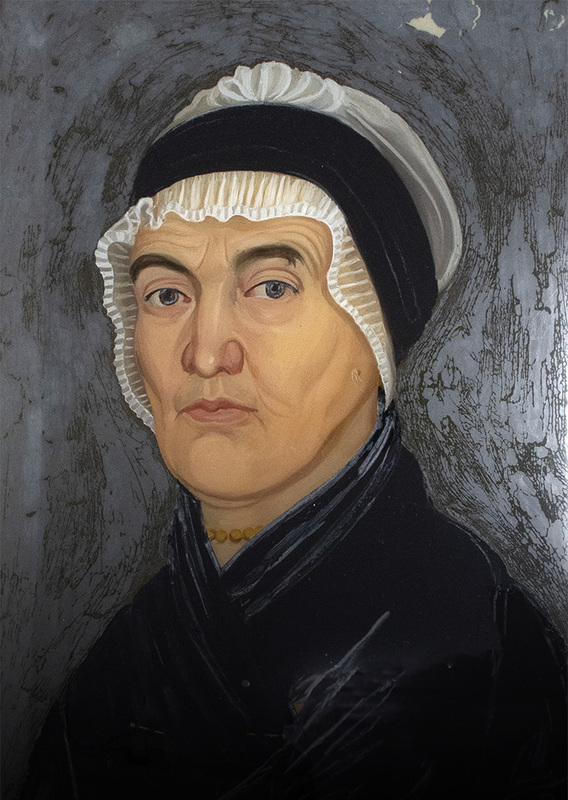 On Christmas Day, 1817, Lois Hyde sat for (or received) this portrait by Benjamin Greenleaf (1769-1821). It is painted on the backside of glass, which creates a vibrant, striking image. But if it is Christmas Day, why does she have the expression of a Grinch or a Scrooge? 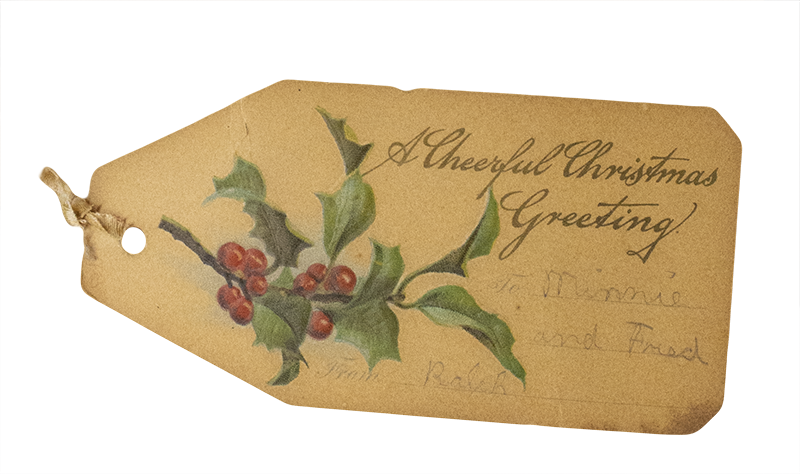 Gift of Clyde B. Holmes, Jr.
What do boats and Christmas have in common? They both depend on the noble pine. 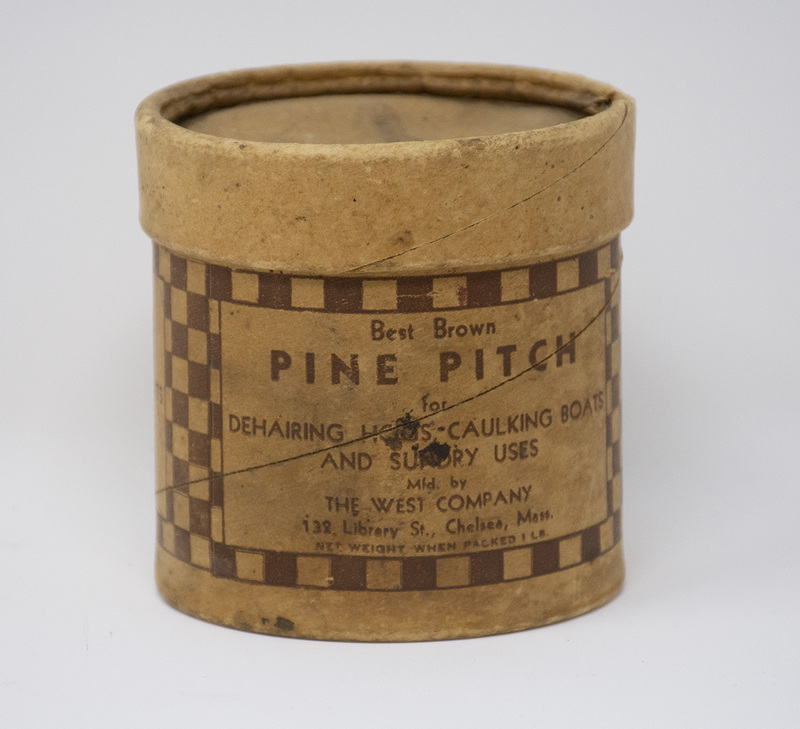 I suppose we could say boats, Christmas, and hogs, because this container of Best Brown Pine Pitch proudly adds “dehairing hogs” to the list. Pine pitch is a mixture of pine sap and charcoal heated over a fire. 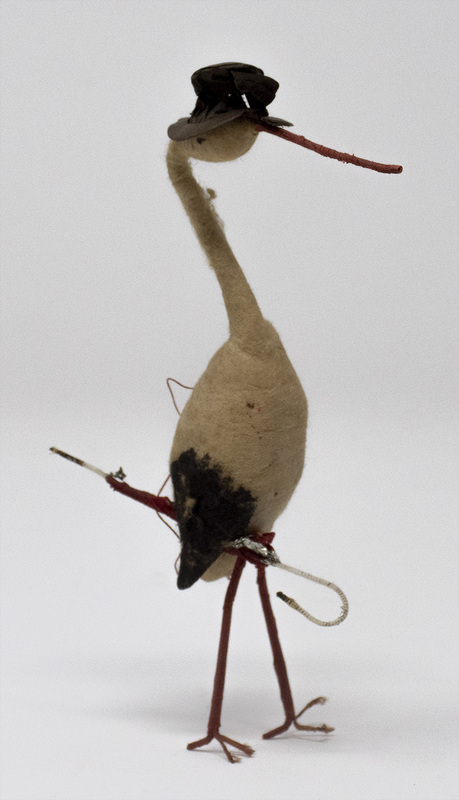 It was, and is, the perfect material to seal oakum fibers in the seams of a wooden vessel. A servant came and chopped the tree into little pieces. These heaped together quite high. The wood blazed beautifully under the big copper kettle, and the fir tree moaned so deeply that each groan sounded like a muffled shot. That's why the children who were playing near-by ran to make a circle around the flames, staring into the fire and crying, “Pif! Paf!” But as each groans burst from it, the tree thought of a bright summer day in the woods, or a starlit winter night. It thought of Christmas Eve and thought of Humpty-Dumpty, which was the only story it ever heard and knew how to tell. And so the tree was burned completely away. The children played on in the courtyard. 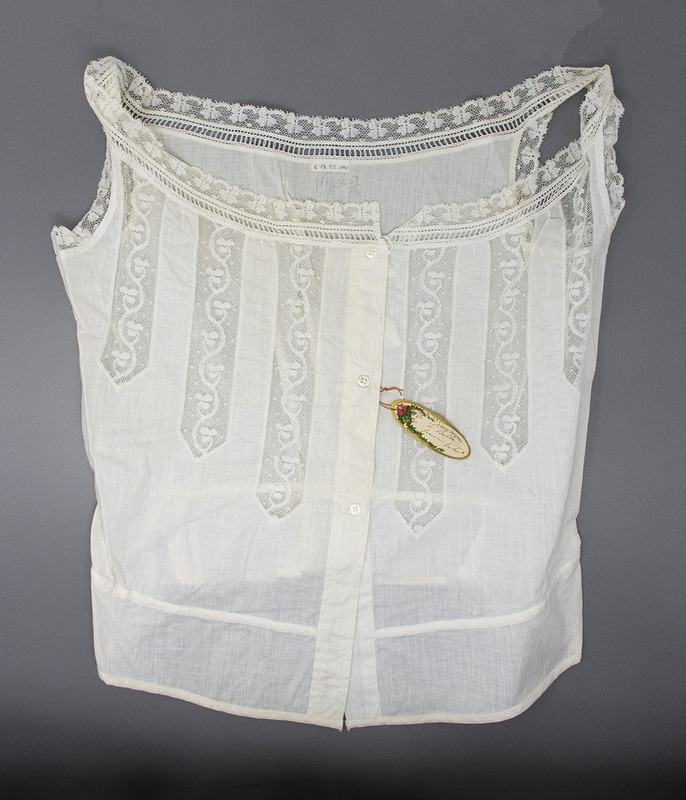 The youngest child wore on his breast the gold star that had topped the tree on its happiest night of all. In other words, and in the words of Ebenezer Scrooge, “live in the Past, the Present, and the Future.” A museum, with all our ghosts of Christmas past, is a powerful place to be reminded of this.